It is difficult not to think that, rich and adored, JK Rowling's gusto has gone. Now she is just, like her hero, set on completing the grand scheme. Into the gloom she is determined to take all those devoted readers. John Mullan, senior lecturuer in English at University College London, writes an extended review of Harry Potter And The Half Blood Prince in The Guardian. In the profile of Philip Ardagh in Author of the month, page 17 (Parents), G2, yesterday, [blogged below] we implied that Ardagh's collaboration with Paul McCartney and Geoff Dunbar, High In the Clouds, was out this month. That is not the case. It is not published until October. However, Philip Ardagh's Horrendous Habits, the latest instalment of The Further Adventures of Eddie Dickens, was published this month. Heads up everyone, there's a new blog on the block. Read Alert, a blog focusing on 'youth literature' in Australia, is maintained by the State Library of Victoria. Marthe Jocelyn's book is an account of Thomas Coram and the Foundling Hospital. Her interest in the hospital was first aroused when she discovered that her grandfather was raised there. Her history, with its moving fictional first chapter, is packed with detail in text and illustration and written in a very accessible and interesting way. An account of what was considered beauty throughout time allows young adults to look more carefully at our present culture of beauty. Shari Graydon helps teens to become critical of the pressures put upon them to conform to type.The book criticises popular culture without criticising the young people drawn to it. This is an account of his childhood in China and the impact of the "cultural revolution" on the Chinese people, particularly on the Zhang family. "All I wanted was to be just like the other kids...." It also depicts his growing determination to be himself , and the inner strength that he had to develop. This book for young children tackles a child's perception of time. Each passage of time, "to jump a rope"- a second, "to build a sandy tower"- an hour, links into the experience of a small child in a very effective way. person to person throughout the town. This picture of life under Nazism, and the way it affected young people also conveys their growing awareness of what is really happening to their community. Faber has sent out excited notice that it will be publishing Ricky Gervais� MORE FLANIMALS on 10 October 2005. MORE FLANIMALS, a sequel to last year's bestselling Christmas title, takes the study of Flanimals to a higher level, and comes complete with charts, a fold-out genealogical table, family trees, and anatomical diagrams. The first FLANIMALS has been translated into 6 languages (more to come) and was a huge hit in the States. A major deal with a Hollywood studio is currently under negotiation to bring Flanimals to the big screen. If it happens, the film will be big-budget with Ricky providing the voice for one of the characters. A pocket-sized edition of the first FLANIMALS book is also due for publication by Faber in October in a collectable format (150x130mm) with a pvc cover. Bloomsbury have announced that Ian Beck is to join their children�s list. His first work for Bloomsbury, illustrating Digory the Dragon Slayer by Angela McAllister, is published next month. In 2006 he will also illustrate Winston the Book Wolf by Marni McGee. With free books already available to those who need or want them, there is something misguided about investing millions in headline grabbing �book bags� when that money could go towards ensuring that, when deprived children finally do enter the education system, schools have the resources to bring them up to speed. The pressure is on for parents to get their children reading over the summer. Schools are eager, sending children home for the holidays with suggested reading lists and instructions to read �at least three books�. The revamped Booktrust scheme, to start in the autumn, will distribute free books across three age brackets. Bookstart, for babies aged up to 12 months, will provide a bag of books, a nursery rhyme placemat and a booklet on sharing stories with young children. The Bookstart plus pack, for children aged 12 to 24 months, will comprise two books, a scribble pad and crayons and a booklist. The third, My Treasure Chest, is for three- and four-year-olds. It will have hidden compartments for small toys and include reading books, an activity book, a scribble pad and crayons to encourage writing. On one of the few days in the publishing calendar when the endangered species of independent bookshops might have been given a terrific financial boost, they were instead reduced to masochistic price cutting in order to catch what retailers call "footfall". ... ... [the now book] got me thinking of pomp rock bands of the 1970s. The bigger they got, the more inflated the songs. Once they started on 13-minute guitar solos, it was time to find punk. At the World Science Fiction Convention in Glasgow this summer, I'm speaking at an event that asks: "Has Harry Potter Set Children's Fiction Back 50 Years?" The paradox is that an essentially old-fashioned story has become an unparalleled phenomenon via the modern wizardry of the most brilliantly inspired, unconventional, expensive and ruthless global marketing pomp the publishing world has ever seen. Harry might vanquish Voldemort, but what about the pomp? In HP7, I'll be rooting for him to find some punk. The winner in the category Best English-language Book with an authentic Welsh background was JACKIE MORRIS for the picture book for readers aged 7-9 years The Seal Children (Frances Lincoln). This the second time that Jackie Morris has won the Tir na n-Og Award. Also Highly Commended was the novel In Chatter Wood, Jac Jones (Gomer/Pont Books). Formal presentations take plac ein the autumn. For winners of the Welsh language categories, read the extended entry. Continue reading Tir Na N-og Winners. It is impressive, given the unprecedented pressure that Rowling is under to sustain a sequence that she planned in obscurity, that she maintains its emotional energy, humour and the many spinning plates of its plot without showing the strain. There will always be those who say that Harry Potter, measured against Great Literature, is not worth the hoo-hah. But the hoo-hah is born of genuine enjoyment, and those who have enjoyed the first five volumes can�t possibly abandon the story now. Rather than miss this, most enthusiasts would, as Peeves the Poltergeist urges in the book, set fire to their own pants. "He was definitely a man of the movies," says Hunt. "I'd argue that he was quite deliberately writing scenes that were filmable. 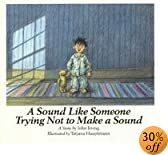 You can see this in a lot of children's book writers these days; they're not writing for the book, they're writing for the film. And I think Dahl was very well aware of that. I wouldn't be surprised if he wasn't writing Matilda or The BFG for the screen, really." S F Said's article about Dahl in the telegraph includes several such quotes from Peter Hunt. One of the many things I love about this writer is the way that she allows for the possibility not only of magic but of reality, which is much harder for children to grasp. As adult fiction increasingly moves towards the banal demands of large chains selling the literary equivalent of soma, so it is the realm of the children�s author to deal with the more weighty matters of life, death and the reason for living. I was shocked when a recent survey declared that 60 per cent of my readers were adults with an even male-female split. Of all the books I�ve read this year Hunter�s Heart by Julia Green (Puffin, �4.99), with its undertow of menace and superb portrait of male adolescence, was the one that truly got under my skin... ... For mature twelve to sixteen year olds � and any mothers wanting insight in to the psyche of teenage boys. Blackman is a terrific thriller writer, driving her plots forward with skill and tenacity. It�s only when she occasionally pauses to admire the view, and throws in a badly turned simile, that the prose skids to a halt. How did a sentence like �my lower jaw hanging like a limp piece of wet lettuce� ever get past the red pen? Would that be Little Gem or Cos? you find yourself wondering. And I fear Blackman�s description of Sephy�s first sexual experience � a �single dazzling rocket bursting into a shower of silvery lights� followed by a whole volley of rockets one after another after another� - will be setting up more than a few teenage girls for disappointment. This is good, critical reviewing at its best. An article from last Saturday's new Books supplent in The Times, focusing on Random House's $500,000 advertising campaign and 1m first printrun for Christopher Paolini's second novel, Eldest. Daily visitors will have noticed that updating of the Blog and main page has been a little glitchy over the past week. And there has been another hiatus in the Mail List Updates. It's all because a happy family event has stolen my attention! Still, there's been the mass media coverage of the Harry Potter launch to keep everyone amused, entertained and distracted. where Rowling has used traditional fairy-tale creatures, she has put her own spin on them. Fairies and sprites are not pretty, benign wish-granters but domestic pests; owls are not familiars but postmen. For every dragon and unicorn there are invented creatures like Thestrals (skeletal horses visible only to those who have seen death), Blast-Ended Skrewts (don�t ask) and, of course, the Dementors. 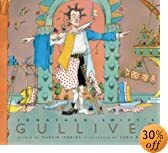 So how exactly did France's most popular but least-acclaimed director come to be a bestselling children's author? Stirring his tea in a large but spartan office on the not-very-spartan rue du Faubourg Saint-Honor�, he is faintly surprised by the question. "Why did I make Subway? Why did I do all that crazy undersea stuff in The Big Blue? Why did I go all black and nasty with Nikita?" he asks. "I don't know. Because I did. I do what I do because I want to do it, because I want to explore, go looking for things. This time it was kids." Besson's fourth Arthur book, Arthur and the War of Two Worlds, is at the top of the French bestseller lists less than a month after its launch. The first three, starting with Arthur and the Minimoys - which has just been published in Britain - have sold more than 1m copies in more than 30 countries. The group was JK Rowling's fellow children's authors, a third of whom earn less than the national minimum wage of �8,827 a year. And yesterday they published a survey of their own, claiming that some work for about 2p an hour. Their survey, headed Not All of Us are Rowling in It, is released as talk of mega-million incomes was being bandied about in the build-up to Saturday's publication of Harry Potter and the Half Blood Prince. The unkindest cut, they say, is to find that "How much do you earn? ", or "Are you rich?" are now the first questions that children, even small children, ask when they do a school visit. Checkmate, final book in Noughts & Crosses trilogy, under half-price! Terence Blacker�s sharp-witted and contemporary Boy2Girl (Macmillan �4.99) for 11+ relates what unpredictable things happen when a new American boy at an English secondary school passes himself off as a girl for a dare. Under the humorous surface it is thoughtful and revealing about identity and relationships. I've just read Blacker's latest children's novel, Parent Swap, which among other things is a bitingly satirical take on reality TV and is also both very funny and thought-provoking. As this is supposed to be a funny book, any distress is glossed over. At the bad times, we are told that the family is "stressed" or "arguing" or both, but no more. And Rose's actual name, the Permanent Rose of the title, is said at the end to be "A promise". I wonder why? Nothing has substantially changed. No guidance has been given. As a child of a dysfunctional family myself, I found it truly depressing. Waterstone's said there has been a tenfold increase in the number of new children's books released every month since 2000. In a state of decline before the appearance of Harry Potter in 1997, sales of children's books excluding the young wizard have since been growing at a rate of 2% a year. "Demand for other children's authors, stimulated by interest in Harry Potter, has helped the publishing industry as a whole," Waterstone's said. "New writers are now taken more seriously, recognised more quickly, and invested in more heavily." New research by the Federation of Children's Book Groups (FCBG), shows that JK Rowling's storytelling has had a major impact on literacy and reading habits in the UK. 'So why do you work for a newspaper?" a journalist once asked me when he discovered that I also worked as a children's book illustrator. Where did Vicky Jones erupt from? In 2001 she was a publishing cliche: the well-read, articulate book-lover who dreams of maybe sitting down to write a novel some day. In 2002 she became the one-in-1000 who actually does it, and at that point our story takes a sharp turn into not-in-my-wildest-dreams territory. In the last three years she has had six novels published, won the New Zealand Post Junior Fiction award, and had her children's fantasy series The Karazan Quartet picked up for international distribution by Puffin. Following this morning�s terrorist incidents in central London, we have reluctantly decided to postpone the ceremony for the CILIP Carnegie and Kate Greenaway Children�s Book Awards. We have taken this decision with extreme reluctance, because we feel strongly that these Awards represent precisely the civilised values that the terrorists are seeking to destroy. However we recognise that it would be irresponsible to encourage people to come into central London when the emergency services are so stretched, and we also feel that a celebration of this kind would be inappropriate when so many people are suffering from injury and, in some cases, the death of loved ones. The ceremony was due to take place at the English Heritage headquarters in central London, on Friday 8 July. As soon as possible, we will make plans for a further ceremony when we can honour the achievements of the winners and the shortlisted authors and illustrators. Meanwhile, we will announce the winners at 12:30 tomorrow, Friday 8 July, as arranged. Barry Cunningham, her first editor at Bloomsbury Publishing in London, remembers giving her "terrible advice" when they met in the 1990s. Rowling was a divorced woman without much money. "She was telling me about her circumstances. I was worried she was really relying on Harry to be the future for her and her daughter," Cunningham says. "I told her she wouldn't make any money at children's books, and she should get a day job,"
The masterminds behind some of the most popular books for adolescent girls are a couple of thirtysomething men. Alloy Entertainment Inc., a division of marketing and advertising giant Alloy, has developed a slew of hot book series, including "Gossip Girl," "The A-List," "The Clique" and "The Sisterhood of the Traveling Pants," which was made into a hit movie. Bloomsbury has just announced that it will make available 'Electronic Press Kits' to accompany the launch of Harry Potter and the Half-Blood Prince. Blogging our own interview with Marcus Sedgwick. An immensely compelling, impressive and thought-provoking young adult novel. ACHUKA has not always been a fan of Sedgwick's writing, particularly the early novels, but we began to be converted by Cowards (non-fiction) and if all his future fiction is as good as this truly exceptional new novel our admiration will be permanent! I was amused to read this in Barbara Ellen's feature interview with Gordon Brown in today's Observer. To find out if Brown's son enjoyed The Gruffalo, check the final paragraph of the feature. Amanda Craig reviews the latest crop of fantasy fiction, including Lord Loss by Darren Shan - "not for children under 12, and those who do read it should be immune to nightmares"
There is something hallucinatory, if not delirious, about this stylish, magical book, the sensation of tenuous recognition, of watching a dream slip away after waking. Then there is the fiddling - every chapter ends with appropriate sheet music for dance tunes - the prevalence of goats, any one of which might turn out to be a p�ka (member of the devil class, according to O'Brien), the ominous shadow of transience that always takes the young unawares, the air of intangible melancholy, all preserved from any suspicion of whimsy by the matter-of-fact voice of the author, her robust sense of fun, and the sheer energy of her writing. 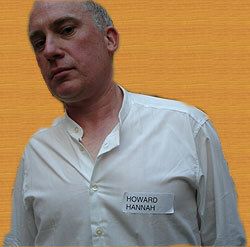 No, this is not the Branford Boase winner, nor is it Howard Hannah. It is, of course, Ted Dewan, snapped at last night's TES Summer Party. 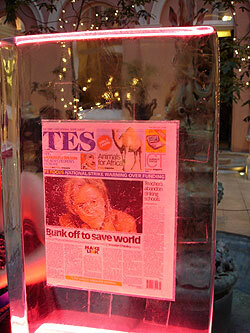 The only other photograph I took was this one of the TES front page encased in a block of ice. It was a luxury not to have to flit around with camera in hand, just chat with some of the other Michael's on Geraldine Brennan's reviewing team, as well as speaking with Elaine Williams and Tom Deveson who, observing that my beard was bushier than when we had last met (he was polite enough not to add whiter) was told that it was a physical manifestation of impending grandfatherdom. The winner was How I Live Now by Meg Rosoff. The award was presented by Mal Peet. Jacqueline Wilson, Children�s Laureate, who sponsored the �1000 cheque accompanying the award said �I have a special affection for this prize since I was invited to be the first Author Judge in 2000. It can be such a struggle for new writers starting out that I am thrilled to be able to offer this support to a prize which can make a real difference to their prospects�. Continue reading Branford Boase Award Winner.